Hot on the heels of the new RS3 saloon comes the revised five-door model, using the world’s most powerful five-cylinder engine. 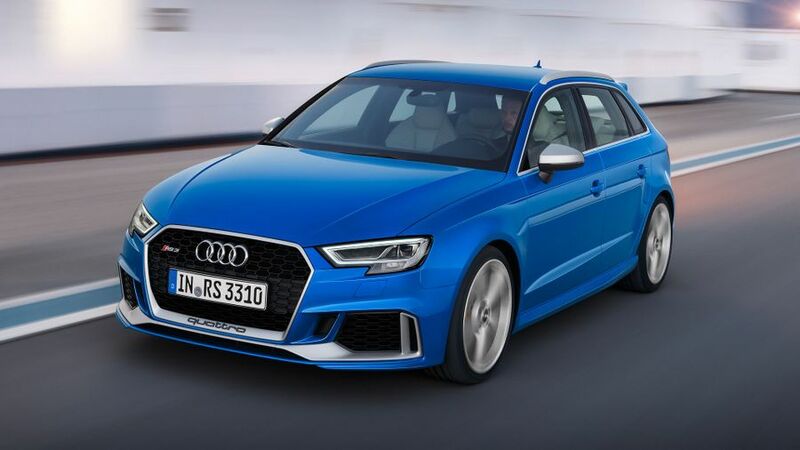 A revised version of the Audi RS3 Sportback will make its world debut at the Geneva Motor Show next month. It will feature the world’s most powerful five-cylinder engine, and will go on sale this summer. The new model shares its engine with the RS3 saloon (which was unveiled at the Paris Motor Show last year), and the TT RS, making this latest model 33bhp more powerful than the previous RS3. As a result, the 0-62mph is just 4.1 seconds and the top speed 155mph, although this rises to 174mph if the optional Dynamic Package Plus is fitted. With Quattro four-wheel drive and a seven-speed semi-automatic transmission, the RS3 averages 34.0 mpg on the combined cycle. The car also has the Drive Select System, allowing the driver to choose between three different modes – comfort, auto and dynamic – which adjust the behaviour of the four-wheel drive, as well as the steering, transmission, engine and (if fitted) adaptive suspension. In common with the rest of the recently facelifted A3 range, the RS3 has the same styling upgrades, with LED headlights as standard, and the car has all the sporty add-ons you would expect of such a quick car: a rear spoiler, large oval tailpipes and 19-inch alloy wheels. The cabin, too, leaves you in no doubt this is a sporty model, with red needles on the dials, a lap timer function in the Driver Information system, and leather-trimmed sports seats. The upgrade improves the in-car technology, too, with Audi’s ‘virtual cockpit’ (which replaces the conventional dials with a fully digital display) now available as an option; and Audi’s Smartphone Interface is standard, giving access to apps via both Apple Car Play and Android Auto. The revised car comes with two new safety features: Emergency Assist (which automatically stops the car if necessary) and Cross Traffic Assist rear, which looks out for crossing vehicles when the driver is pulling out of a parking space. The RS3 goes on sale in the summer, and first deliveries are expected towards the end of the year. Its prices and specification are yet to be confirmed, but we expect the car to cost from a little more than £40,000.